Explore the numerous day-trip ideas around Koli National Park: Joensuu (Sculpture Susi Kosiomatkalla & Botania - Botanical Garden and Tropical Butterfly Garden). For photos, ratings, other places to visit, and other tourist information, go to the Koli National Park travel route planner. 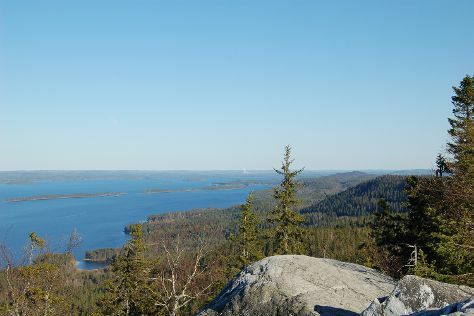 Helsinki to Koli National Park is an approximately 4.5-hour flight. You can also drive. Expect slightly colder weather when traveling from Helsinki in April: highs in Koli National Park hover around 6°C, while lows dip to -2°C. Cap off your sightseeing on the 12th (Fri) early enough to travel to Jyvaskyla. Jyväskylä is a city and municipality in Finland and in the western part of the Finnish Lakeland. Kick off your visit on the 13th (Sat): test your problem-solving skills at popular escape rooms, stop by Punnitse & Saasta, learn more about the world around you at Natural History Museum of Central Finland, then get engrossed in the history at Finnish Air Force Museum, and finally see the interesting displays at The Alvar Aalto Museum. To see ratings, more things to do, and other tourist information, read Jyvaskyla travel app . Drive from Koli National Park to Jyvaskyla in 4 hours. In April, daytime highs in Jyvaskyla are 7°C, while nighttime lows are -3°C. Finish your sightseeing early on the 13th (Sat) so you can drive back home.